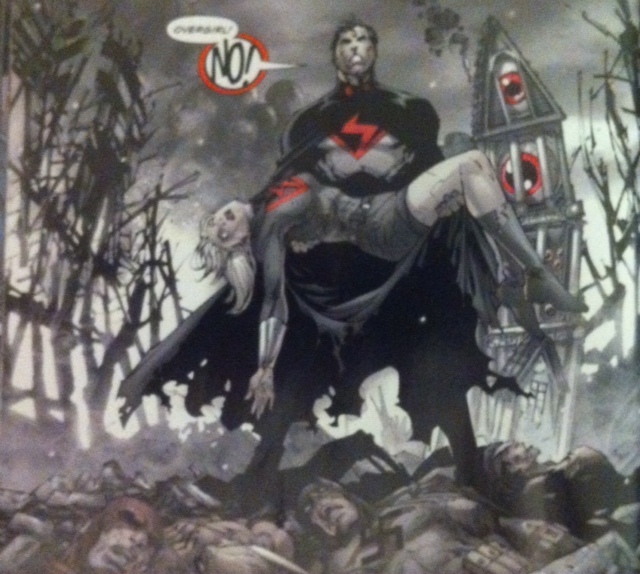 The Multiversity: Mastermen #1. Writer- Grant Morrison, Penciller- Jim Lee, Inkers- Scott Williams, Sandra Hope, Mark Irwin, Jonathan Glapion, Colorists- Alex Sinclair, Jeromy Cox. This is a story about Superman- a well-written and insightful story about power and the burden of almost god-like powers and their effect on a person. Much like Pax Americana which is not a classic take on the Charlton Action Heroes, this issue is not really about the Quality Comics characters,the Freedom Fighters but rather an alternate take on Superman and what happens when the character questions his motives and actions. The setting of this story on a parallel earth in which the Nazis won World War II and continue to rule, provides an appropriate setting for this type of story. Make no mistake that the questions Morrison raises about the Nazi Superman, Overman, have a direct analogue to the classic Superman character. The issue opens with Hitler being given the news that a rocket has been found bearing a near invulnerable child who is then taken in and raised by the Nazis to be Overman. Our familiarity with the origin Superman story makes it to follow the jumps and conclusions that Morrison leaves out or is on which he is vague. The story takes us through time from WW II to the present. 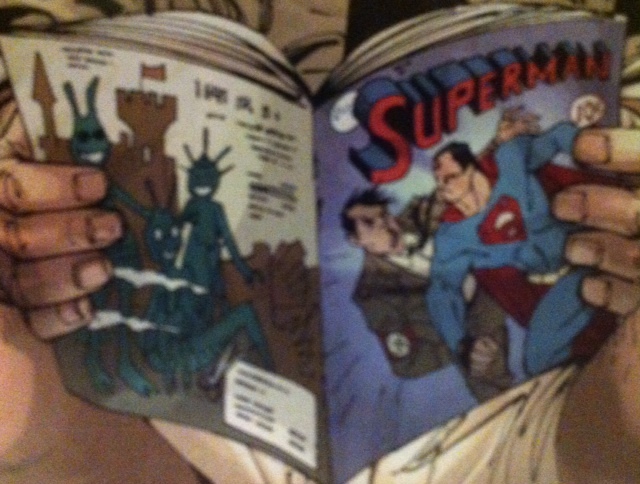 We meet a Nazi Justice League called the New Reichsmen and see Overman in a relationship with a woman named Lena. This part feels very much like a riff on Watchmen, specifically Overman and Lena compared to Dr. Manhattan and Laurie. The role the New Reichsmen play seems very similar to the Crimebusters, although with the nature of the Nazi society they uphold, “Watchmen” feels like a better name. 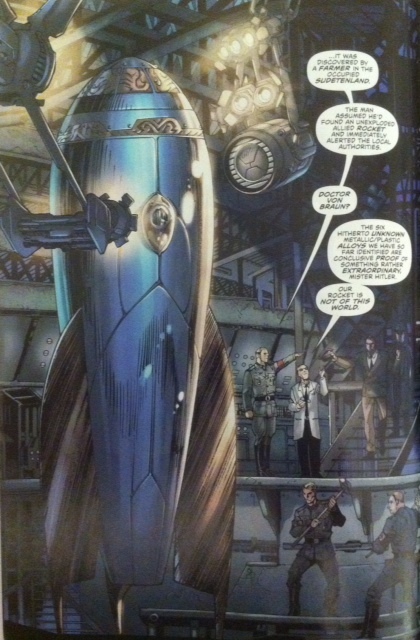 Of course Alan Moore in Watchmen paints the Crimebusters as well as all costumed vigilantes as fascist types anyway. The allusions seem quite clear. 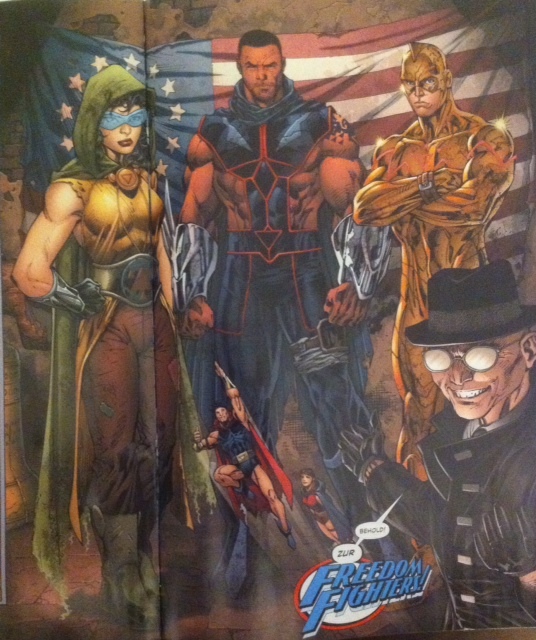 In terms of the overall Multiversity storyline comics are shown on this world, some recognizable and some Marvel analogues and a Dr. Sivanna is supplying the Freedom Fighters with weapons from an alternate earth. As with many of the issues of Multiversity, Mastermen gives a glimpse into the world without really brining anything to a conclusion. However, the end of the issue does recall Kingdom Come slightly in that Overman sees the world he helped make and he doesn’t like it. In this sense Morrison is almost presenting the antithesis to his own work, All-Star Superman. Overman sees what his legacy will be much like Superman does in that story, but the legacies are diametrically opposed. This is a dense issue with lots of themes and allusions for the comic book literate. I almost wonder how different it would be if I were to read this devoid of the knowledge of Watchmen and Kingdom Come. I think it’s clear that Morrison is writing this for the reader who has that previous knowledge and can appreciate the homages, whether it’s Crisis on Infinite Earths #7, or Jim Lee’s homage to himself with an image from Superman: For Tomorrow. 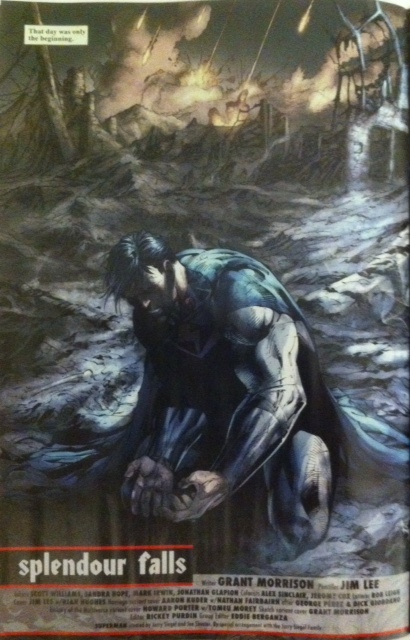 But it also allows Morrison to include the allusions to other well-known works that will enhance the reader’s understanding of the themes and ideas Morrison is presenting about Superman. The substance is rich that this issue almost functions as a response to the classic “Must there be a Superman” tale by Elliot S! Maggin, Curt Swan and Murphy Anderson from Superman Vol.1 #247. The only negatives I can point out are the focus on Superman instead of the Freedom Fighters and the density of the story for those who are not familiar with Watchmen, Kingdom Come and All-Star Superman. If you were hoping for the Freedom Fighters or a straight forward story you will be disappointed. Like the rest of Multiversity, Mastermen is a thoughtful, engaging comic. It challenges the reader and really questions the nature of Superman and explores his self-image and psyche. It belongs on the shelf next to Morrison’s best Superman work, All-Star Superman.